One or two semester course, units based on hours served, grades 10-12. Prerequisites: Students must be highly motivated to serve the community and have the personal time to do the internship or service learning project outside of the regular school day. Students must be committed to meeting with the Internships teacher after school three times a quarter to review process and progress. Description: Academy Internships is designed to empower students and to build collaborative relationships within the local community. The structure of the Internship class is designed from a combined service learning, empowerment, and transformative learning perspective. It is set up with a series of empowering activities including preplanning, initial exploration, site selection, and contract design. The requirements for the Internships course include a commitment to academic education and skill development that are couched within an emancipatory pedagogy. Through transformative learning, students can become empowered citizens. Through school-community partnerships, the potential for ameliorating social problems is strengthened. As we create a new community of learners in the twenty-first century, the role of the school in the community may be strengthened through the Academy Internships class. Prerequisites: Teacher/counselor recommendation, GPA of 2.0 or above upon enrollment, average or above average standardized test scores and student’s personal goal of attending college. Description: The AVID course is an elective class for students who are college-bound. The AVID curriculum focuses on writing, inquiry, collaboration, organizational skills and reading (WICOR) through the AVID High School curriculum in both teacher and tutor-led activities. While concurrently enrolled in a college-prep course of study, students learn strategies to enhance success. Note-taking, outlining, writing, speaking, reading, test-taking strategies and self-awareness are stressed. One or two semester course, 5 units each semester, grades 11-12. Prerequisites: Most assignments require computer literacy, excellent attendance, and a willingness to work. Students must be placed in program by their counselor. Students are not guaranteed their choice of teacher. Description: Students are provided with an opportunity to gain on-the-job experience at various work stations in the high school setting under the supervision of a staff member. These work stations may include assignment as a teacher’s aide, office aide, clerical aide, cafeteria aide, maintenance aide, recycling aide, or student tutor. On-the-job experiences may include filing, typing, answering phones, delivering messages, assisting other students, recycling, working in the cafeteria, assisting the custodians. Note: School Service does not meet the Career Technical graduation requirement. Variable credit will be earned for late entry. Students entering after the quarter grading period will receive 2.5 units out of the 5 units/semester. A combined maximum of 10 units may be earned in School Service and/or Lab Assistant. Prerequisites: Recommendation of AVID elective teacher and tutor training as provided by the AVID regional offices. Student tutors must agree to sign a confidentiality agreement. Description: Student tutors are expected to tutor 5-7 students two times a week, and assist the teacher in providing academic and organizational skills to the students. The tutors are expected to be able to tutor in at least three subjects in which they have been successful at an Honors or Advanced Placement level, which include, but are not limited to Foreign Language, Language Arts, Mathematics, Science and Social Science. Tutors will receive instruction in tutoring students using the inquiry method that encourages higher level thinking by the students who are being tutored. Prerequisites: Elected ASB and class officers are required to enroll. Other interested students may enroll on the basis of application interview and recommendation of two teachers. A "C" average is required of all students enrolled in Leadership Workshop. 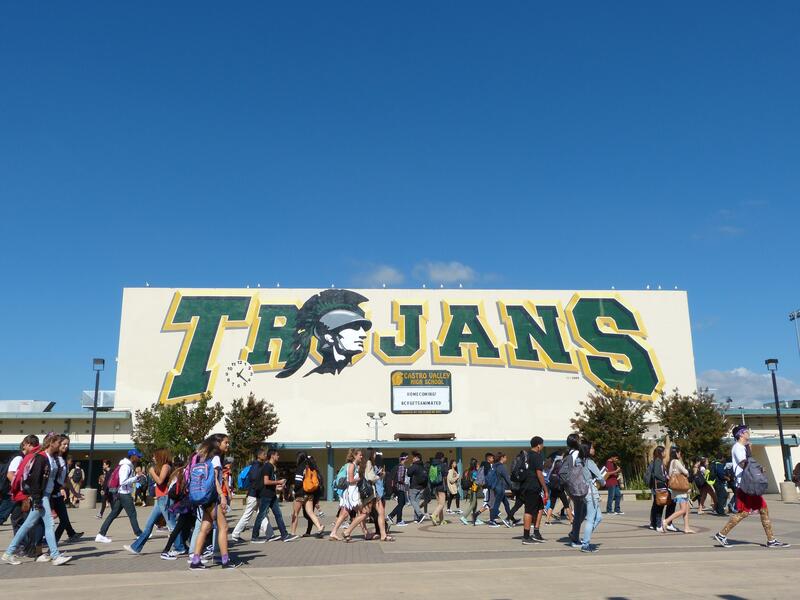 Description: Students will plan and implement Castro Valley High School student activities. This course offers practical application of leadership skills: communication, decision-making, goal setting, planning and organizing, parliamentary procedure, and public speaking. Leadership students will be expected to put in hours beyond class time including, but not limited to, working in the student store, community service, and event set-up/clean-up. Full year course, 5 units each semester. Prerequisite: A "C" average is required for this course. Students must have the approval of the Peer Support, Conflict Mediation or Youth 2 Youth Advisor before course sign-up. planning. The course will utilize a variety of modalities such as experiential learning via classroom presentations, research and fieldwork, program planning, implementation and evaluation. Prerequisite: Student must be at least 16 years of age and be employed in a job that fits within Department of Labor guidelines for the student’s age and full-time student status. Student must have a job prior to enrolling. Description: Outside Work Experience (OWE) provides the student with an opportunity to earn school credit while working in the community and help in finding a full time position upon graduation from high school. Students are supervised by the OWE teacher and must meet twice a week for related classroom instruction, which includes such topics as job search strategies and techniques, interviewing skills, employer-employee relationships, and filing income tax forms. Necessary forms and contracts must be submitted to the OWE teacher in order to begin receiving credit. Upon successful completion of the course, the amount of credit earned depends upon the number of hours worked (36 hours worked=1 unit of credit), with the maximum number of units allowed upon graduation being 20 units within the two semester time limit. Deadline for proof of employment is the third week of class. Note: Outside Work Experience will not meet the graduation requirement for Career Technical Education. This class is limited to 33 students per section.